Visit this remarkable city, with its near 2.500 years of history, and its downtown and historical districts. Follow through the most picturesque streets and alleys of Alfama. Because its foundation is dense bedrock, it survived the 1755 earthquake, and a walk through this old-fashioned residential neighborhood is now a step back in time. Then, west of Lisbon, visit the historical Belem—home of the shipyards where, in the 15th century, Portuguese caravelas (sailing boats) were built and expeditions departed to find the way to Africa, Asia and Brazil. 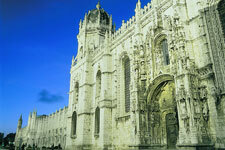 We will visit the Jerónimos Monastery, a master piece of the manueline style, and stop by the famous landmarks: Belém Tower and the Monument to the Discoveries. Departure to Sintra, a small delightful town in the forest covered Mountain of Sintra, immortalized as "Glorious Eden" by the World famous poet Lord Byron. Located about 30 kilometres northwest of Lisbon, there will be a visit to the Royal Palace of Sintra, a fabulous royal residence of many Portuguese Kings, with wings and halls dating from the 13/14th Centuries. 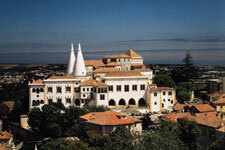 Sintra is excellent for shopping souvenirs and handicraft, and there will be time at leisure. Descending the mountain on to Cape Roca, the Western-most point of continental Europe, a stop will be made by the cliffs over the Atlantic Ocean. Then following the coastline the tour will pass by Guincho Beach, Boca do Inferno (Hell's Mouth) an ocean carved spectacle in rock. Arriving at the old fishermen village of Cascais, which in the 1940's was chosen as residence by exiled European Royalty, a stop will be made by the lovely bay filled with fishing boats. Time at leisure in Cascais, and return to Estoril. 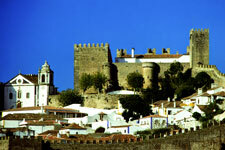 Departure to Óbidos, one of the most charming Portuguese villages, completely enclosed within the ramparts of the Medieval Castle. Walking visit with entrance by the 18th Century arch covered in glazed tiles (azulejos), bright white small houses along cobblestone narrow streets, flower pots on window-sills, Gothic and Renaissance churches specially the beautiful Church of Santa Maria reminds the importance of Óbidos past. Continuation of the tour to Nazaré, the most famous fishing town in Portugal. Among the bright colored rowing-boats moored on the beach bathed by the Atlantic Ocean, one may watch the fisherfolk bring in the nets. A superb view is enjoyed from the "Sítio", a belvedere on top of the hill while in the streets you may observe women still wearing the traditional 7 skirts costumes. Lunch is included and will be served at a local restaurant. The tour will proceed to Fátima, the wellknown Roman Catholic Marian Shrine; Visit the Basilica and the Chapel of Apparitions that marks the spot where the 3 shepherd children had the visions in 1917. Time at leisure for individual activities.